We have had a great Summer here in Gansbaai and Cape Town. The water has been unusually warm for the last month and definitely not what it should be at this time of year. The normal water temperature in Summer in Gansbaai is around 10-13c but we have had days where the water temperature raised to over 21c! This is very unusual but we are not complaining as the warmer waters have meant an increase in shark activity around the boats. When the water temperature drops to under 12c the Great White Sharks tend to lose interest in feeding and it is very difficult to keep the sharks interested in the boats. Some say that the sharks just conserve energy and do not eat but other opinions seem to make more sense to me that the Great White Sharks actually slow down their metabolism when the water temperature drops. This then in turn suppresses their appetite and need to feed which then is what we see when the sharks do not show much interest in the bait and chum at the boats. The weather has been hot and sunny throughout January and February but with the normal South East strong summer winds on days as expected. It has been worse in previous years though and we have been able to get out most days. The shark activity has been excellent considering it is low season with an average of 6 different Great White Sharks per trip although some days it has taken some time to attract the sharks to the boats. In the summer patience is required on some days and we must all remember that we are working with wild animals and can never guarantee sharks or how the sharks behave on the day. Winter is coming with the recent sighting of Sub Antarctic Skuas around the boats on the way to and from the dive sites. They love approaching the boats as some of the crews feed them pilchards by hand and the guests love seeing this interaction! With winter coming we are very excited for the day the sharks move from the beach areas back to Dyer Island and Shark Alley. This is where the water visibility is better and the sharks then are normally much more relaxed in good visibility and show much more interest in the cages and crew working with the bait line. We have had a real mixture of sizes with the Great White Sharks from small juveniles around the 2 meter mark to some very large animals over 4.5 meters long! It is peak seaosn now for the Blue & Mako Shark diving which is my favourite dive! Just being out in the deep ocean in the middle of no-where surrounded by playful sharks and no cage really does it for me. 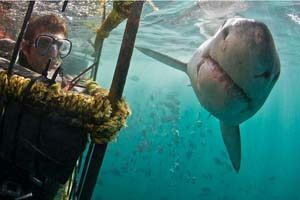 This is a really fantastic experience and one not to be missed by the expernenced scuba diver that loves sharks!! Being out in the blue is very special as you never know what you may get out there and last year we had some fantastic encounters with Sunfish, Orcas, Sperm Whales, Pilot Whales, Tuna and much more. You just never know what you will find out there on the day! To date we have not seen a Great White Shark out there in the blue as they tend to stick close to their foodsource along the coastline but there will be a day when we will strike it lucky! The visiblity out in the deep is anything from 15-30 meters and the water is a toasty 22c+. We basically drive out from Cape Point and keep going whilst reading the temperature climb on the gauge. It climbs from 16c or less in the green coastal waters to the deep blue Indian ocean waters overlapping at 20c+. It is great getting out there and watching the water colour change and then it is just a waiting game whilst the crew work hard to attract the Blue & Mako Sharks. The 7 Gill cow sharks are here in large numbers and this is such as fantastic dive to do as an add-on at the end of the Blue & Mako dive. The 7 Gill cow sharks seem very relaxed and totally unfazed by the divers. We do not feed the sharks which is a good thing as they are known pack hunters and although they are very relaxed around divers their staple diet is seals so they are very powerful predators. We are coming into the best time to snorkel and dive with the seals. With the seal pups now entering the water off Duiker Island near Hout Bay snorkeling with seals is a world class experience! The seals and very curious at this time of year and will approach the divers, pull on fins and make extremely close passes. This is definitely a thing to do when in Cape Town if you can swim. The seals are living on Duiker Island and enter the water in the kelp and where there is reef protecting them from the open sea and Great White Sharks. The sharks are thought not to enter the kelp as they are not comfortable in confined spaces and the seals can swim and play freely in the water without the threat of predators. The snorkel or dive is believed to be totally safe and we have groups going out daily to the island to interact with the seals. The sharks have been great in Mossel Bay this summer with generally warmer water averaging from 19c – 21c this is a place that you can possibly cage dive in your bikini! Last month we had an average of 5-12 sharks per trip and an average visibility of 4-6 meters so great shark activity all round with happy faces. This is an excellent place to see the Great White Sharks if you are heading up or down the Garden route and do not have a chance to go to Gansbaai. Durban has been going very well with the summer sharks here and many sightings of Tiger Sharks, Bull Sharks and Hammerhead sharks as well as the resident Black Tip Sharks. There is also 1 stray Ragged Tooth Shark still hiding in Raggies cave which is great to see at this time of year as it is unexpected. The groups have been going up to Mozambique and enjoying some stunning dives on Pinnacles with the Bull, Tiger sharks and Hammerhead sharks. It is rainy season so not great for tanning but we have had some great days and more importantly fantastic times underwater! Remember if you are not en experienced diver you can also do a cage dive in Durban which is a fantastic experience and introduction to sharks as no experience is necessary! Well with winter slowly starting to move closer we must all start to think about the spectacle that is the Sardine Run! With spaces going fast you must book your places on the boats as soon as possible! Check out our packages and join us on an adventure of a lifetime!